Like with most things iPhone-related, the sight of a new application sends people into a frenzy. However the latest development in augmented reality applications could be useful for both ecommerce and the news industry. The latest and greatest in augmented reality/iPhone applications is called Nearest Tube, by application-development company acrossair. Once you’ve downloaded the application from the iPhone application store, fire it up and hold your iPhone out in front of you. Using your phone’s internal GPS, it will coordinate where you are and then determine where the nearest Tube station is. It lists the name, location, lines and how far you are from it. Imagine a browser in which you view the real world through a camera lens and a heads-up display picks out interest points amid the living cityscape. This type of augmented reality has been the stuff of science fiction, but the cell phone browser Layar by Dutch software developer SPRXmobile claims to make it real. For the news industry, augmented reality mobile applications could have huge implications. Imagine loading a news organisation’s AR application and holding it front of you. Once you do, notifications appear on screen showing you the approximate locations of news items relative to where you live. It would be hyperlocalism realised. The metadata could also include geotags to alert an AR device of where the story originated from. It hasn’t happened yet (that I’m aware of) but it can’t be far away. The news organisation can make money both off the sale of the device and in charging a monthly fee to access the data. It’s a business opportunity waiting to happen. Is augmented reality a mobile killer app? Already, brands are experimenting with it and the opportunities to apply augmented reality to a variety of applications are intriguing. 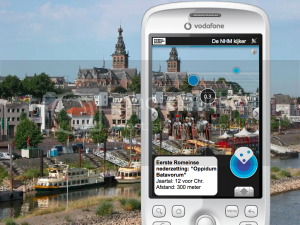 One startup that’s attracted attention recently in the space is Amsterdam-based Layar, which has created an augmented reality ‘browser‘. The recession may be barreling along, but advertising optimism is on the rise. A new study released by Advertiser Perceptions Inc. last week found that ad confidence is on the rise generally. But online advertising is expected to grow more than most. And interestingly, marketers are more bullish on mobile media that advertising agencies. That’s good news for the space.